A dachshund, literally meaning a badger dog -- a breed developed by German foresters to scent, hunt and kill hole-dwelling animals. 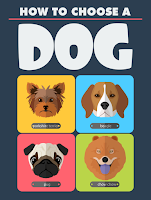 In the United States, it is sometimes referred to as a wiener dog or sausage dog. The dachshund is 5 to 9 inches tall and has an average lifespan of 12 to 14 years. Explain the physical characteristics of dachshunds? Dachshunds are characterized by a long body and short legs. Loose skin, long drooping ear, and a barrel-like chest are the other features of dachshunds. They are red, chocolate brown, fawn or black in color. Dachshunds exist in standard, miniature and tweenie sizes. They have short haired, smooth haired, long-haired or wire-haired coats. What is the difference between standard and miniature dachshunds? A miniature dachshund weighs less than 11 lbs, and a standard size dachshund weighs between 16 and 35 lbs. Considerable time, patience, and firmness are required on the part of the owners, as well as dog trainers to train dachshunds. It is always advisable to train dachshunds when they are puppies. Dachshunds training should be game oriented and food-based. These small dogs love it when you praise them. Dachshunds require a modest amount of exercise. 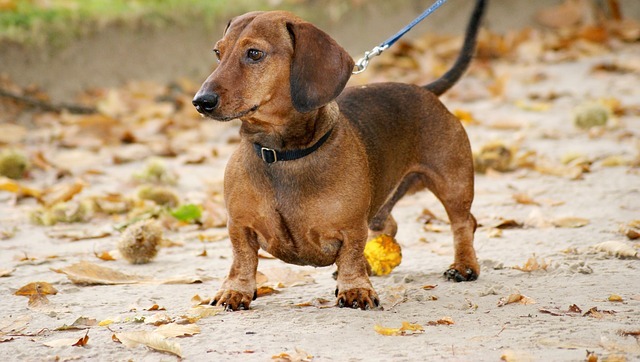 Dachshund exercises are generally a moderate walk and games in the yard. Shorthaired coats require minimal grooming. But, wire-haired and long-haired coats need regular brushing, trimming and clipping. Due to its stubborn nature, it is quite difficult to housebreak a dachshund. But properly devised training programs coupled with consistency and persistence can transform a stubborn dachshund into a sociable breed. Housebreaking methods include a direct method, paper method and crate training. How are dachshunds with children? Dachshunds are generally good with children if they are properly trained and socialized at an early age, especially when they are puppies. How are dachshunds with other pets? Dachshunds easily get along with pets like cats, provided they are given proper training and instruction when they are puppies. Dachshund Pups are known by many nicknames, including "Wiener Dogs", "Sausage Dogs", "Doxies", or "Worshonds". Dachshund pups are known for their long backs and short legs, which many people relate to a wiener sausage or hot dog. It is very important for you to understand how to train Dachshund pups, which requires that you become aware of some of the temperamental and behavioral traits of this fun breed. "Kurzhaardackel" by Toschka at de.wikipedia - Own work. Licensed under Public Domain via Wikimedia Commons. Dachshund pups have an enhanced sense of smell because they are considered 'sense hounds.' This makes them naturally very curious about any new smells that they come into contact with. They are a lovable and playful breed and are often inclined to chase small animals that they see outdoors. On the other hand, Dachshunds are also well-known for being a fairly stubborn breed, which can make training Dachshund puppies challenging. Here is some very helpful and beneficial information that will be sure to help you understand the best way to go about training your Dachshund pups. Dachshunds, especially miniature dachshunds are a fairly small breed, especially when they're pups. Dachshund pups are quite the rambunctious breed and are usually always eager to play with other members of their household "pack". Dachshund pups love to chew! They have been known to destroy shoes, socks, household objects and furniture if not watched closely. That is why it is important and best to start training Dachshund pups at a very early age. Successful training of your Dachshund puppies may take a little time, but don't give up! Allowing your Dachshund puppies to become comfortable in your home is very important and should be done first. They will want to 'check out' all of the new sights, smells, and sounds in the new environment. Dachshunds are very curious and love to investigate. Dachshund pups tend to get themselves into trouble at first, so although you should allow them to roam their new environment, make sure to keep a close eye on them. It may be smart to try to puppy-proof your home as best as you can before you bring your Dachshund pups home. As with all breeds, it is very important to reward the Dachshund puppies for good behavior. Dachshund pups love receiving rewards! Including positive reinforcement in all Dachshund pups training will go a long way. Remember that Dachshund puppies, in general, are naturally playful, so try not to get frustrated with the training. Be patient and before you know it, the puppy will find it easier to focus on their training. Crate training is important and Dachshund puppies respond well to crate training, as long as you introduce it early on. Dachshund pups have a need for constant companionship, and they can become lonely if left alone for too long. You should be careful and aware that puppies can feel "abandoned" while left in a crate if left too long. Keeping a puppy confined to a crate can lead to the pups developing behavioral problems and destructiveness, so crate training should be taken with care and caution. For best crate training results, be sure to buy a crate that is large enough for your Dachshund, but be sure it is not 'too' big to where they could go to the bathroom in it. A puppy will be more likely to have a successful crate training experience by making their crate very comfortable and cozy. Dachshund puppies tend to like bedding material in the crate, making sure to cover any uncomfortable corners. A very important aspect is to have puppies lie on and use the bedding before you put it in the crate so that their scent is already on the bedding. This helps them feel more comfortable inside the new environment of a crate. It is very important to NEVER use a crate to punish dog! This can definitely be extremely detrimental to crate training. House training Dachshunds as soon as possible is very important because even when house trained, not all Dachshund pups can be 100% reliable to not have an 'accident' indoors. So, the sooner the house training, the better! To greatly improve your chances of house training success, combine house training with a crate. Most Dachshund puppies will do very well with this combination. To ensure that Dachshund puppies do not become lonely while in their crate, put the crate in an area with constant activity. Feeding Dachshund puppies their meals while they are in their crate is a good method. After Dachshund pups are done with their meal, you should close the door and allow you're the pup to stay in the crate for an hour or less. You should then put a leash on the puppy and take it outside to a designated 'potty' area. Most puppies will go to the bathroom at this time. This is especially true when they are still in their puppy stage since they tend to need to potty more often and more quickly after meals. Remember that your puppy loves rewards, so it is very important to reward them with praise and treats when they potty outside. Make sure to not allow Dachshund pups to gain a sense of 'dominance' in a household. This will only make training Dachshund pups more difficult. Make sure to establish your role as the pack leader and teacher with a calm and assertive, but firm attitude, especially when it comes to training Dachshund pups. It is important and very beneficial to you and your pup to remain patient and understanding about the behavioral traits of Dachshund pups. As long as you follow that, training Dachshund pups will not be difficult. The Dachshund is a dog breed within the hound family and is known for its short legs and elongated body. The German name "Dachshund" literally translates as "badger dog". Dachshunds were first used to hunt and chase badgers. In the United States, they are sometimes called "wiener dogs" or "hot dogs" due to their shape. Dachshunds weigh from 16 to 32 pounds, though Miniature Dachshunds usually weigh less than 11 pounds. "Tweenie" refers to the group that falls between 10 and 15 pounds. Dachshunds are only 9 inches tall, though they are longer than they are tall. Dachshunds are known for their loose skin, crooked legs, and outward chest. Dachshunds were designed like this so they would be able to go through tight spaces while hunting. They also have a long tail, which is used by hunters to pull Dachshunds out of the hole once the prey is caught. There are three different types of coats that Dachshunds have: long-haired, wirehaired and smooth. Dachshunds also vary a lot in color. Most are red or black & tan. However, they can vary from cream to blue to fawn. Dachshunds are playful dogs that are very loyal. They are known to chase birds and smaller animals with determination. Dachshunds can be difficult to train, as many are stubborn. Dachshunds are clever and are usually not shy at all. Dachshunds seem to not know or care about their own small size. They are also recognized for their complex facial expressions and deep eyes. Unfortunately, they are prone to spinal problems because of their unique shape. Obesity in Dachshunds only makes it worse, but many believe spinal problems in Dachshunds is mainly genetic. To prevent spinal problems, they should not walk up or down stairs quickly or jump. Carrying Dachshunds in the proper manner is also a way to prevent spinal issues. Treatments do exist though, as there is physical therapy, massage, acupuncture, arthritis medication and more. Although some believe Dachshunds may have originated in Ancient Egypt, modern Dachshunds have come from European breeders who have mixed English, French and German terriers and hounds. Dachshunds were popular pets for royalty in Europe, although the original Dachshunds were larger and weighed around 35 pounds. They were used not only for hunting badgers but for large game such as wolverines as well. Dachshunds have been considered a symbol of Germany. Unfortunately, in the United States and England in World War I, some Dachshunds were killed on the streets because of what they symbolized. Dachshunds were used in political cartoons to ridicule Germany, but fortunately, this association has ended. Dachshunds make great watchdogs, as they are attentive and bark when they need to. They get along well enough with other animals and should be groomed regularly as their ears must be cleaned and their nails trimmed. Dachshunds are now quite popular pets in the United States, as they have been about the 5th most popular dog breed in the last ten years. Dachshunds are especially popular for owners who live in apartments. Famous Dachshunds include Lump, Pablo Picasso's dog, Little Dog in 2 Stupid Dogs, Buster in Toy Story 2 and Odie in Garfield the Movie. The Dachshund is an extremely popular dog breed which has ranked in the top ten most popular dog breeds for many years. Dachshunds were ranked 6th out of 154 dog breeds registered by the American Kennel Club (AKC) in both 2004 and 2005. When most people think of a Dachshund, they think of a small dog with a smooth and shiny coat, long body, floppy ears and short crooked legs. However when you consider buying a Dachshund and start to research the dog breed, you find there are a diverse and wide range of sizes, coat varieties, colors and patterns. The original Standard Dachshund was developed to hunt badgers. The breed had to be: built low to the ground, agile and muscular enough to pursue the badger through a maze of underground tunnels, and brave enough to tackle its formidable adversary. Many people poke fun at this “sausage dog”, but they don’t know how he was bred to be low, long, muscular and athletic. Dachshunds are scent hounds and track their prey by scent and not by sight. This breed is courageous and single minded in its work. Once the Dachshund had cornered its prey in a tunnel, he barked to let the hunter know where he was located under ground. Today the Dachshund still retains its hunting instinct and, if off leash, will follow a scent ignoring any previously learned commands. Dachshunds come in two sizes – the Standard and the Miniature. Miniature Dachshunds were bred down in size by German hunters to hunt rabbits. The AKC standard says that Miniatures should weigh 11 pounds or less. Standard Dachshunds have no weight limits but usually range from 15 to 30 pounds. Apart from the size difference, both types have the same appearance. The Dachshund breed comes in three different varieties of coat – Short-haired or Smooth, Long-haired and Wire-haired. The Shorthair is the most prevalent and has a short, dense and shiny coat that most people associate with the Dachshund. The Long-haired Dachshund has a soft and sleek coat that is well fringed on the ears, chest, under side of the body, legs and tail. The Longhair looks something like a small Irish Setter. The Wirehair has a short, dense and wiry outer coat with a dense undercoat and also has a beard, bushy eyebrows and prominent ridges over its eyes. The three coat-type varieties, while all Dachshunds, seem to have minor differences in temperament. The Longhair’s temperament seems more laid back, kinder and gentler reflecting the softer coat. This gentler demeanor doesn’t seem to impair its field trial competitiveness at all. The Wirehair’s temperament seems to be bolder and brasher than the other varieties and a little more like a terrier in demeanor. The Shorthair seems to be the most independent and stubborn of the three varieties. Another area of diversification is the color of the Dachshund’s coat. The most common colors are red (ranging from reddish blond to deep rusty red) and a black and tan combination. The black and tan dogs are all black with tan markings on the head, chest and paws. Other two-color combinations are chocolate, blue or fawn with tan markings. Wirehairs have coats that are commonly a black and light hair mix called wild boar. The final area of diversification is the pattern of the Dachshund’s coat. There is a dapple pattern that consists of a dark base color with contrasting light areas. A double dapple pattern is varying amounts of white occurring over the body in addition to the dapple pattern. Finally there is a brindle pattern characterized by dark stripes all over the body. Given that you can decide between the size, coat type, color and pattern - why would you want to choose a Dachshund? Dachshunds are wonderful fun loving dogs that adore their owners and want to be involved in everything that is going on. The Dachshund has a whole host of virtues such as: amiable, intelligent, brave, alert, loyal, playful, inquisitive and dignified. They also make good watchdogs. On the less positive side, the Dachshund is somewhat independent and mischievous and will follow an interesting scent to the exclusion of everything else. Both Miniature and Standard Dachshunds make good apartment dogs that are small enough to travel everywhere with their owners. It really is no surprise to see why the Dachshund is one of the most popular small dog breeds registered by the AKC.